Animal Tissues. Nervous: spinal cord. Atlas of Plant and Animal Histology. 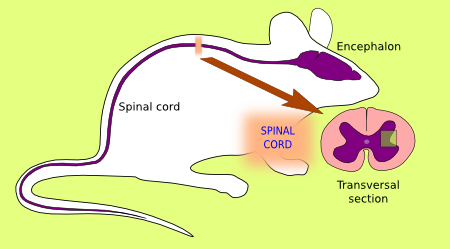 The image is from the spinal cord. After common staining, nervous tissue in the spinal cord, as well as in the encephalon, is made up of cell bodies showing different size and morphology, which are dispersed among many cellular processes: dendrites and axons. The larger nuclei, showing well-defined nucleoli, belong to neurons and are surrounded by abundant cytoplasm. There are acidophilic granules in the cytoplasm, referred as Nissl bodies, that are clusters of rough endoplasmic reticulum with many ribosomes. Dendrites and axons are intermingled and branched, and they are so abundant and dense that resemble amorphous substance among cell somata. Some axons run tightly packed in bundles. 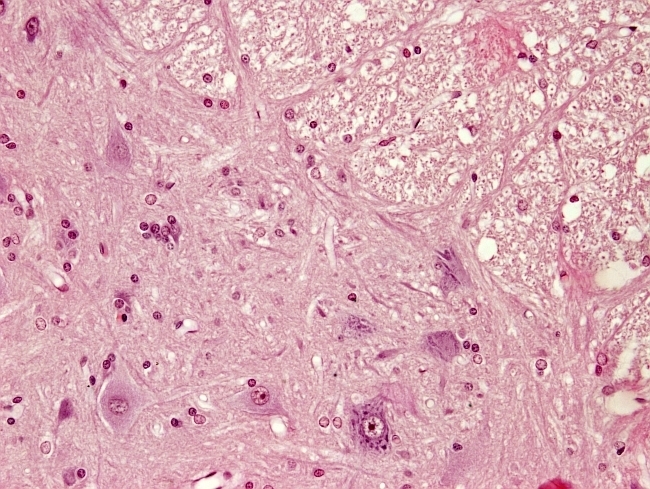 Smaller cell bodies belong to glial cells, which contain a small nucleus and few amount of cytoplasm. Often, glial cells are associated with the neuronal bodies and axons. This is because glia gives support to neurons and form myelin sheaths around axons. In the spinal cord, neuronal bodies, dendrites, axons, and glial cells are distributed in two compartments: an external one known as white matter, mainly consisting of axons surrounded by myelin, and an internal one or gray matter with more neuronal bodies and dendrites. Glial cells are found in both parts.